My husband, Scott, spoke about the legacy we leave as parents (and grandparents, aunts and uncles, teachers, etc.) yesterday and included a special prayer for Mother's Day. One of the things that he pointed out was that Mother's Day doesn't always bring happy memories for everyone. For some people it is the most painful day of the year. For some, it's the first Mother's Day without their mom. 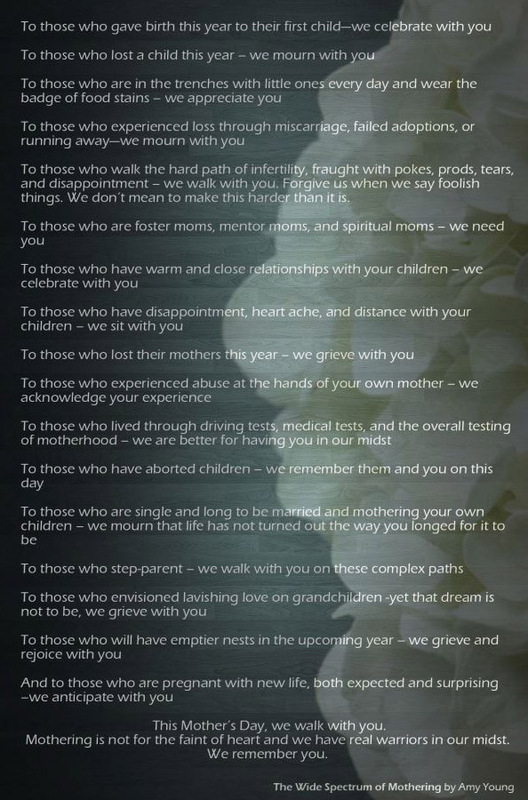 For others, it's the first Mother's Day without their child. For others still, it's a reminder of the longing they have every day for a child of their own. 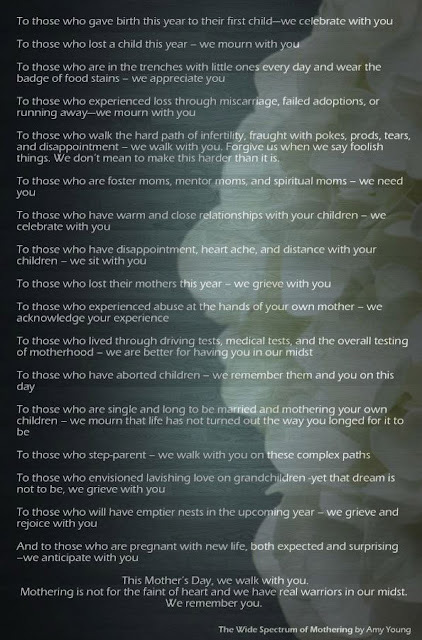 This really spoke to me, as I was in the middle of celebrating my first Mother's Day as a mother of two, with a sweet daughter added to our family this year. After we got home from lunch, I saw this picture below. "The Wide Spectrum of Mothering" by Amy Young was read at a local church during their services yesterday and I thought it was so fitting...it was exactly what Scott had spoken about. I thought that it was worth sharing today, as a reminder that everyone is going through something and needs prayer for their certain situation! Will you join with me in praying for each of "those" listed below? Have a wonderful week as you bring hope into your home though the One who brings us all hope!